The best portable coffee makers… All those shapes, design features, brewing mechanisms – you take a quick glance and your head starts spinning. Choosing is so excruciating that you’d swear you won’t ask for coffee-to-go. But you just can’t do it without that warm liquid hug for the brain, can you? So, you take a deep breath and another sip from the third-and-still-counting cup of coffee for today and you keep digging. Chances are you bump straight into one of those famous French press portable coffee brewer models – they’re all over the internet. Or a travel drip coffee maker, ideal for your hotel stays. Perhaps even a Bialetti traveling coffee pot, since you’re flirting with the Airbnb accommodation options? Don’t Obsess About The Brewing – Focus On The Bigger Picture! Sure, brewing is crucial but it’s just one piece of the jigsaw puzzle. And so is the size. Also, consider your portable coffee maker depending on the material, required coffee and filters, how much you can get from it and how fast, not to mention how sturdy it will be. Coming up next, we’ll walk you through all these aspects and show you the best portable coffee makers for all the travel styles you might want to embrace. Stop feeling depresso, an espresso will come your way! And you’ll never again spend a morning away from home without your cup of freshly brewed coffee. Let us show you how. Here’s our TOP 10 – Best Travel Coffee Maker Selection! I used to think that all the coffee beans in Colombia won’t make me a morning person. But you know how life forces you into doing terrible things such as… still having to wake up early. And so I did, drinking coffee more like for the protection of those who happened to be around me when I was up but not awake. I did what I had to do and got myself the best portable coffee maker. Or so I thought, because, over the years, I’ve tried more than a dozen of “best” portable coffee makers. With every new model, I learned new things that didn’t even cross my mind the first time I bought those brewers. If you stick around for a while, you won’t have to do such mistakes! What’s the secret to spotting the best traveling espresso maker? You’d be surprised, but it’s all about asking yourself the right questions. There are, indeed, many different models out there that could easily rank for the best travel coffee maker. What makes the difference, as suggested above, is your travel style. Where you’re heading, what transport means you will take, and the amenities you’ll have at the destination. If you travel by plane, for instance, a portable coffee brewer without metal parts will spare you from getting the shivers at the airport control. And if you’re going to a place where you have the means to boil water, your options will suddenly expand. But aside from all that, you have to think about yourself. How handy are you when it comes to making your coffee? Do you take the time to grind your coffee and know exactly how long to brew it for the perfect taste? Or you find coffee to be the most important… meal of the day and you can have it anyway, as long as you have it? How much coffee can it brew at once? What kind of filters will you have to use? How easy will it be to get your coffee drip? Will the cleaning part kind of scare you away? What is it made of, any chance to alter the taste? Any chances to accidentally shatter the coffee pot? If it’s sturdy enough, does it also keep your coffee warm? And what kind of coffee can it serve? Plain American coffee style, perhaps the fancy French coffee, or the creamy Italian espresso kind of coffee, for those whose blood type is coffee? Now, we cannot answer all these questions for you, but we can certainly show you a selection of the best portable espresso maker models out there. You choose what works best for you, with all of the above questions in mind. Mild and heart-warming or strong that it wakes up the neighbors – you can have your coffee either way, with one of the following coffee makers! 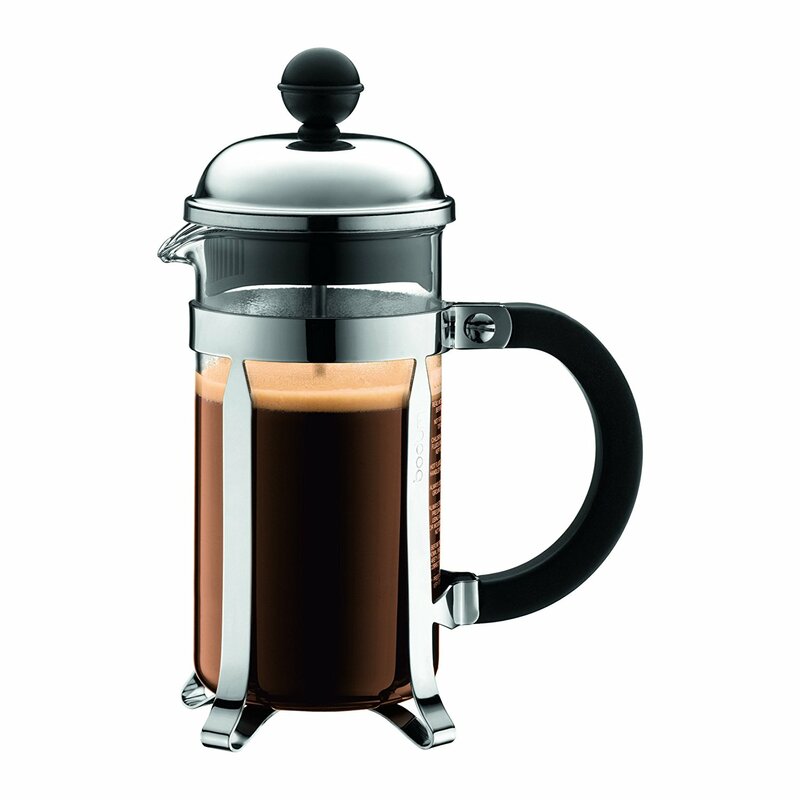 We recommend this KONA French Press Coffee Maker as the best travel coffee maker in our top 10. Available in 2 colors (Black and Red) and 2 sizes (12 and 34 oz), we’ve picked the stylish, black model at 34 oz, figuring that 1 liter of coffee should do it. The French press system is one of the simplest out there: you pour hot water over coarse coffee, stir, let it brew, and press the filter down to push the coffee to the bottom of the pot. What makes it a top traveling coffee pot, however, is the high-quality mix of sturdy glass and plastic, plus the 3-piece steel infuser filter system. Moreover, the KONA French Press Coffee Maker measures 10 x 5.9 x 5.5 inches and weighs less than 1 lbs. It has the looks, it brews hot and cold beverages, it will get you both coffee and tea, and it was built to last. So, consider this thick borosilicate glass carafe with insulated outer shell and the BPS/BPA-free plastic lid for all your travels. You’ll find its overwhelming number of positive online reviews truly mind-blowing. It is lightweight, portable, and handy to work with, in pretty much any environment. Some would appreciate a metal lid, as the plastic one tends to lift up. The Bialetti Stovetop Espresso Maker is a unique presence in this top of best portable coffee makers. The only stovetop traveling espresso maker, the only option for rich, authentic Italian espresso, and the only 1-cup model. While available in 5 colors (Silver, Black, Red, Blue, Orange, Purple) and 5 different sizes (1, 3, 6, 9, 12 cups), we’ve picked the classy 1-cup silver brewer. The Bialetti is an iconic Italian coffee maker and the 1 demitasse cup (2 ounces) should kick your lazy mornings as a solo traveler in no time. This Bialetti Stovetop Espresso Maker is the second lightest in our top, at 0.5 lbs and 4.4 x 2.9 x 4.4 inches. As long as you have a stovetop at hand, you fill the top filter with some fine-ground coffee and the lower chamber with water, turn on the low heat, and wait for the espresso to move to the upper chamber and start bubbling. Embrace this design with flip-up top, easy-grip knob, side-pour spout, patented safety valve and cool-touch plastic handle if you’re used to very strong coffee! It is made of sturdy and elegant pieces that fit together nicely. As a stovetop model, it tends to limit your options, depending on where you’re staying. Back to French presses, the SterlingPro French Press Coffee & Tea Maker is a best seller in coffee presses on Amazon. 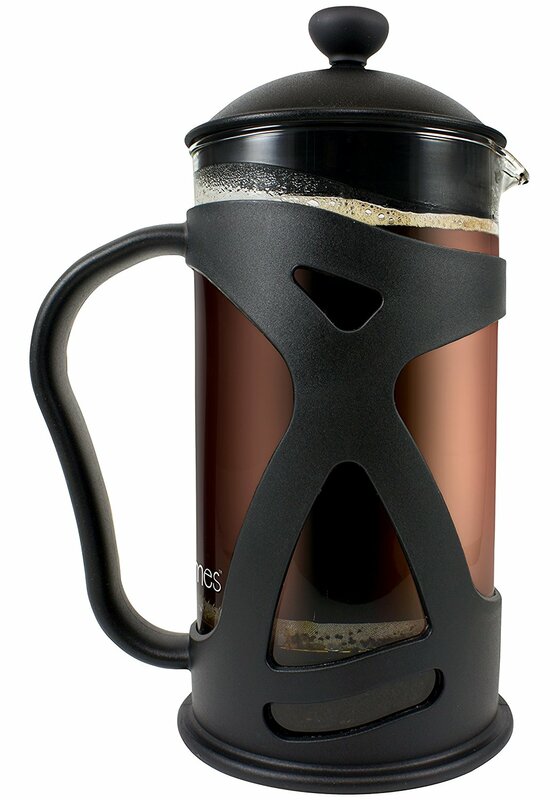 Available in just one model, Chrome, and one size, 34 oz, it is similarly designed with the KONA French Press Coffee Maker. One notable difference, however, is that this portable coffee brewer encloses its glass carafe in 304 grade stainless steel, not plastic. The SterlingPro French Press Coffee & Tea Maker can be your best portable coffee maker, despite its hefty price tag. It is certainly smaller than the KONA model – 8 x 5 x 4.3 inches – yet it weighs the same 0.9 lbs. It works by the same principles but it comes with two extra replacement screens. It is, just like many buyer reviews would pinpoint, superior in filtering all those grounds from your coffee, compared to whatever other compact travel coffee maker with a pressing mechanism – that’s why they call it a best seller! Allows all pieces to snugly fit together when brewing. Some would appreciate an easier reassembly process. The BLACK+DECKER Brew 'n Go Personal Coffeemaker is a travel drip coffee maker that, just like the Bialetti Stovetop Espresso Maker, will give you a single-serve. The difference, however, is that it’s an electric model, not a stovetop, and it brews your coffee straight into a stainless steel, insulated travel mug, larger than the one of the 1-cup Bialetti. You’ll find it in two colors (Black & Steel or Black & White) but one size, which is given by the 15 oz cup with 2-1/2 inch diameter bottom. This BLACK+DECKER Brew 'n Go Personal Coffeemaker will have another correspondent in our top, though that one will rank lower as a best portable espresso maker. This particular model measures 7 x 10.2 x 6.9 inches and weighs 2.7 lbs, three times more than the 0.9 lbs KONA French Press Coffee Maker or SterlingPro French Press Coffee & Tea Maker. It stands out because, despite being a drip model, includes a mesh metal filter. It also has the convenience of starting with the touch of a button. And it stops right after it finishes brewing, something that not all the electric traveling coffee pots do. All components – mug, basket, filter, mug lid – are easily detachable and dishwasher safe. Some would also appreciate a slightly larger water reservoir. The Aeropress Compact Travel Coffee Maker is, by definition, one of the best portable coffee makers out there! The lightest model in our top 10, it also includes the most accessories – filter, plunger with rubber seal, coffee scoop and coffee stir, a funnel, 350 microfilters with special holder, and a zippered nylon tote bag. You’ll want to have this portable coffee brewer with you wherever you go and especially if you’re taking a flight. This Aeropress Compact Travel Coffee Maker measures 4.8 x 4.5 x 11.8 inches and weighs 0.4 lbs. The lightest, as mentioned, but if you consider the 1-4 scoops capacity, where each scoop can make a single espresso or a 5-oz cup of American Coffee… This traveling espresso maker could also be the smallest in our top for this capacity. Plus, it works with this fast and amazing brewing process of total immersion, giving you coffee in a minute or so! Whether you’re an everyday coffee drinker, a business traveler or a backpacker, it could be the one! Can be easily cleaned, with a simple, 10-second rinse of the plunger. Grinds that are too fine can make the plunger quite hard to push. The Mr. Coffee Travel Drip Coffee Maker is one of the few drip models that truly stand out and the only programmable model in our selection. This means that yes, you can set it up in the evening and wake up with the smell of freshly brewed coffee first thing in the morning! One Black model, made of plastic and sturdy glass, is the only offer you’re going to need for this 4-cup portable coffee maker. The second heaviest in our top, this Mr. Coffee brewer weighs 3.1 lbs and measures 7.1 x 9.6 x 10.7 inches but it’s a good investment. The programmable option with delay timer left aside, you still have an awesome lift and clean filter basket and the auto pause drip available during brewing. Rest assured, you won’t have to wait for it to brew the whole 4 cups before you pour your first cup and you won’t have to worry about coffee dripping on the hot plate while you do so! Comfortable to use, with light status indicator and auto shutoff. The design of the glass carafe makes it difficult to pour all the coffee in it. 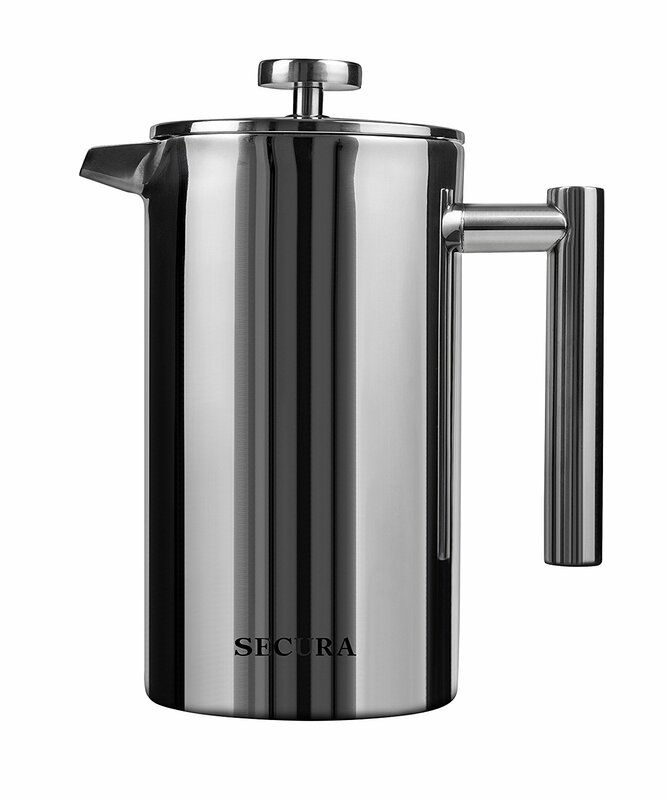 The Secura Stainless Steel French Press Coffee Maker comes as a single model, full 18/10 stainless steel, in and out, screen filter included. You’ll notice that it is also the most expensive model from this list with best portable coffee makers, so, expect for stainless steel quality! We would recommend you the 34 oz size, but you can also choose an extra-large one, at 50 oz. 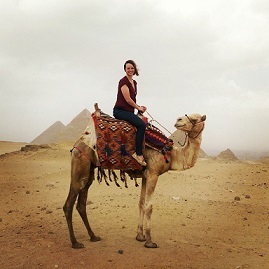 If travel space is not your problem and you know there will be more than one coffee drinker at the destination, select what works best for you. With this Secura Stainless Steel French Press Coffee Maker, you’ll get the same principles you’ve seen with the KONA French Press Coffee Maker and all the other French Press best portable coffee maker models. But think of the double wall construction, at 6.7 x 6.1 x 9.8 inches and 2.4 pounds, and you’ll have to agree – while it’s adding some extra weight, it also ads extra insulation! All of its parts are dishwasher safe, making the cleanup less than a hurdle. A better insulation would have also been appreciated. The LINKYO Large French Press Coffee Maker looks like a bigger version of the above Secura Stainless Steel French Press Coffee Maker. We have selected the same stainless steel model, at 50 oz this time, though you can also choose a 34 oz version if you’d like. The LINKYO series boasts 6 portable coffee brewer models, combinations of these two sizes and 4 design models (Classic, Matte, Glass, Round). Of course, with the good looks and big size comes an equal price, the offer being somewhat pricey. The LINKYO Large French Press Coffee Maker we have selected – 50 oz, Classic – measures 6.6 x 7.3 x 9.8 inches and weighs 2.6 lbs. A bit taller and heavier than the Secura best portable espresso maker, but only because it’s the 50 oz, not the 34 oz version. Otherwise, you get the same performant and reusable stainless steel multi-screen filter, ready to warm up your mornings in just a few minutes. Catchy look, with polished mirror finish. The handle’s plastic knob can easily deteriorate in time, so, keep your guarantee at hand. The Bodum CHAMBORD Coffee Maker is one of the best travel coffee maker French press models you’ll hear people talking about. We loved the fact that it also comes with the richest selection of sizes, just like the Bialetti Stovetop Espresso Maker. So, from the 5 options of 12, 15, 17, 34 and 51 oz, we chose to recommend you the smallest, 12 oz version – for variation, because it’s a different size from the other traveling coffee pot models you’ve seen, and, of course, for convenience during travel. So, this Bodum CHAMBORD Coffee Maker comes as a single model, Chrome, with the mentioned sizes, and a body made of glass, stainless steel, and plastic. At 5.43 x 7.56 x 3.39 and only 0.7 lbs, it’s certainly one of the smallest and lightest recommendations. The glass is heat-resistant, the plastic is BPA-free, and the mesh filter is an attractive 3-part stainless steel piece. Other than that, the reputation of this product speaks for everything else, so, just check the pros and cons from below and you might make up your mind! It is easy to use and easier to clean straight in the dishwasher. The metal exposed to water can rust in time, if not dried properly. 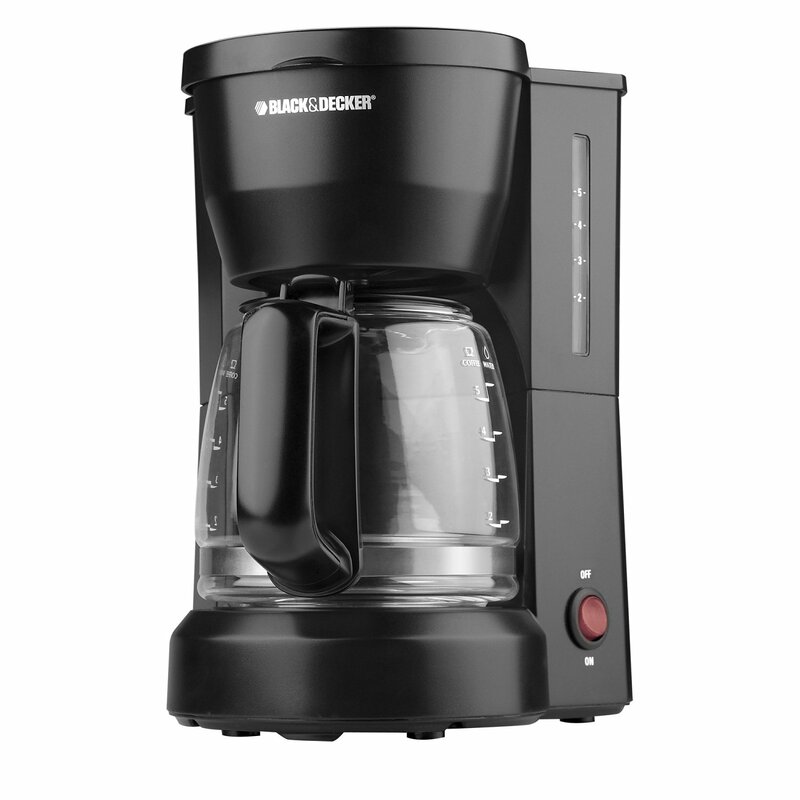 The BLACK+DECKER 5-Cup Coffeemaker is the last best portable coffee maker that we really wanted you to know of! This second suggestion from BLACK+DECKER is a model of the extremes. On one hand, it is the cheapest best portable espresso maker we’ve shown you and, on the other hand, it is also the heaviest. Of course, the latter is because it’s a drip unit that works with electricity and despite its compact design, it still weighs 4.54 lbs! At the same time, the 9.75 x 7.25 x 10.75 inches BLACK+DECKER 5-Cup Coffeemaker comes in 3 models (Black, Black & Chrome, White) and 1 size of 25 oz. Made mostly of BPA-free plastic, with a glass carafe, this one looks nothing like the better rated BLACK+DECKER Brew 'n Go Personal Coffeemaker. 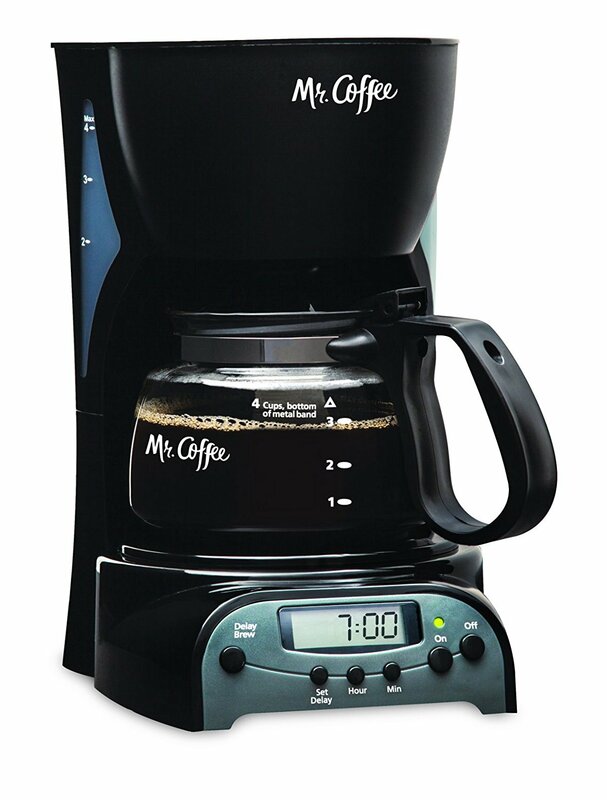 Its reservoir with measurement markings, the hot plate, keep-hot carafe, the light indicator and all its other design features make it more similar to the Mr. Coffee Travel Drip Coffee Maker, minus the auto shutoff. The hot plate should keep your coffee warm for up to an hour. The 5 advertised cups might be smaller than what you expect.